Product Description The Koehler K87700 tag tester offers simple automation routine for easy operation. For flash point determinations of liquids with a viscosity of below 5.5 centistokes (cSt) at 104°F (40°C) or below 9.5cSt at 77°F (25°C), and a flash point below 200°F (93°C) except cut-back asphalts, those liquids which tend to form a surface film under test conditions and materials which contain suspended solids. The automated Tag Closed Cup flash point tester ensures the accuracy and precision required according to the ASTM D56 and related test methods. 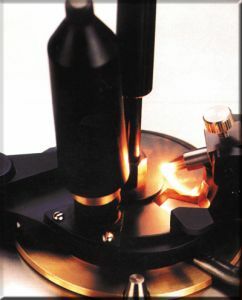 The test sample is heated at a prescribed rate of temperature increase throughout the standard temperature test range to 100°C. The flash point tests are simply conducted by mounting the flash cup filled with sample into the test position and selecting a pre-programmed test method or the search mode to determine an approximate flash point. The automation routines provide accurate test results. Ignition by gas flame or electrical ignitor is included, along with safety cut-off devices. The measurement range can be extended to --30°C by any appropriate external chiller. Supervision software is included. Installation and training on site is mandatory and is additional cost.